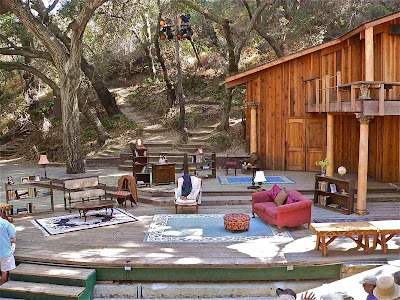 It was another night of sucking in culture for Betty as she accompanied her friend to the Theatricum Botanicum out in the lovely Topanga Canyon. This outdoor theater was originally started by Will Geer (Grandpa Walton!) in the 1950's after he and others were backlisted by Hollywood. He owned the land and since he was unable to find work in Hollywood he grew fruits and vegetables and herbs and invited his (also blacklisted) actor friends to come out and participate in the theater. Today they are a professional repertory theater, offering a variety of performances and outreach to nearby schools. This season they are putting on Julius Caeser, Cymbeline, A Midsummer Night's Dream, The Cherry Orchard, and The Miser. We loved the outdoor setting. 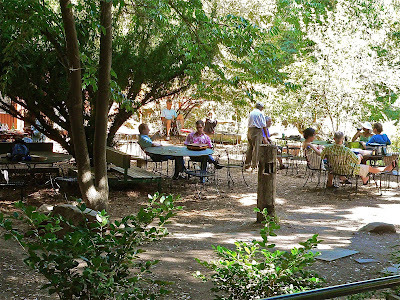 People are encouraged to bring a picnic and eat it on the grounds. 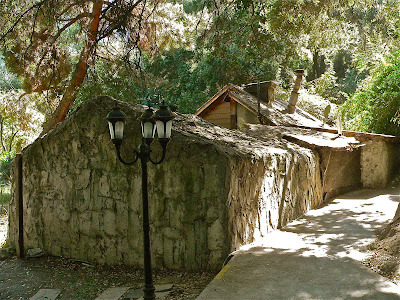 Loved the old buildings and the winding walkways. We saw The Cherry Orchid by Chekov. This was the stage. Very cool, huh? 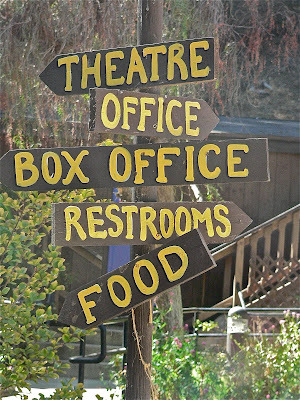 Thanks Theatricum Botanicum! I'll be back!